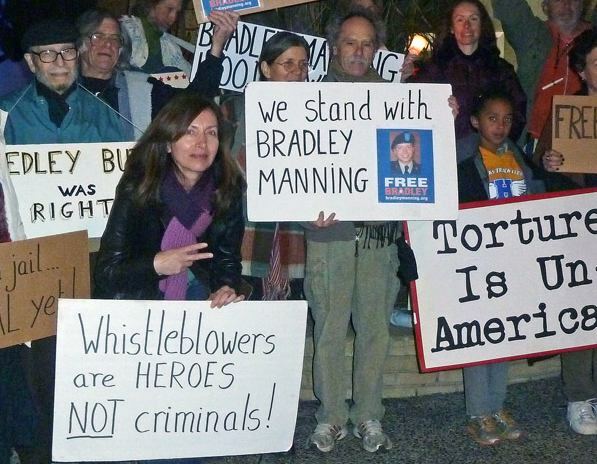 The trial of Private Bradley Manning, began Monday at Fort Meade, a military base in Maryland, north of Washington, DC. Manning has been in custody since his arrest on May 29, 2010 on charges of disclosing classified information to Wikileaks. The second day of the trial focused on the hardware Manning used, his training, and his internet chats with Adrian Lamo. Lamo testified that he chatted with Manning over a period of six days, starting May 20, 2010. He said that Manning mentioned WikiLeaks founder Julian Assange but never expressed disloyalty to the United States. “At any time, did Pfc. Manning ever say he wanted to help the enemy?” defense attorney David Coombs said. “Not in those words, no,” Lamo said. (David Dishneau, Associated Press). Legal documents and transcripts of court proceedings in the Manning case are available at alexaobrien.com.